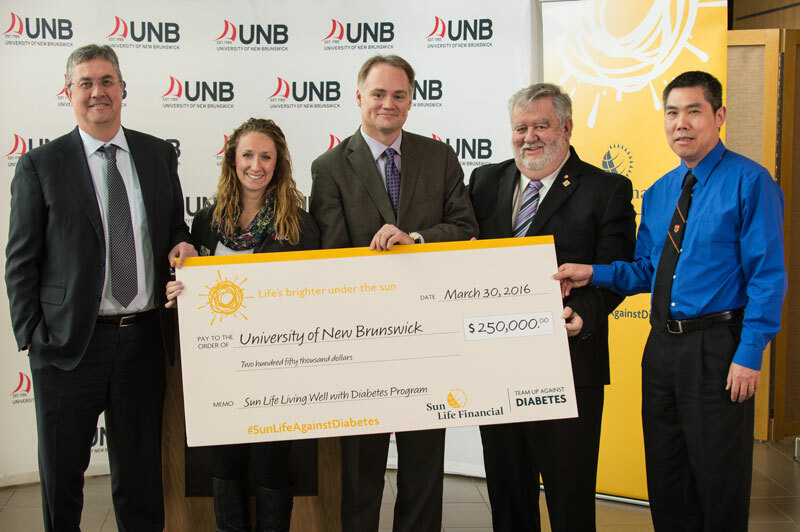 A $250,000 donation from Sun Life Financial Inc. (TSX: SLF) (NYSE: SLF) is helping the University of New Brunswick (UNB) launch the Sun Life Financial Living Well with Diabetes Initiative to assist those living with diabetes or who are at risk for developing the disease. The donation is part of Sun Life Financial's Team Up Against Diabetes program, and is another step towards the company’s goal of preventing diabetes and its related complications. Sun Life Financial made the announcement today, along with representatives from UNB. The Sun Life Financial Living Well with Diabetes Initiative will raise awareness of the lifestyle factors that contribute to both preventing and managing diabetes. Participants will have access to free education sessions on the importance of physical activity and healthy living with expert physiologists, dietitians and physicians. Resources to help adopt effective preventative and care strategies such as subsidized personal training and recreation services, and nutrition workshops will also be offered. The funding will allow UNB to expand its services currently delivered through the Sun Life Financial Fitness Assessment Centre (SLFFAC), now in its ninth year of operation. The SLFFAC enables kinesiology researchers, graduate and undergraduate students to work together to deliver personalized fitness programs to improve the strength and health of participating students and community members. Sun Life Financial is a leading international financial services organization providing a diverse range of protection and wealth products and services to individuals and corporate customers. Sun Life Financial has operations in a number of markets worldwide, including Canada, the United States, the United Kingdom, Ireland, Hong Kong, the Philippines, Japan, Indonesia, India, China, Australia, Singapore, Vietnam, Malaysia and Bermuda. As of December 31, 2015, the Sun Life Financial group of companies had total assets under management of $891 billion.